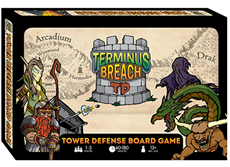 Defend Arcadium Empire from Draklord and his hordes of minions in Terminus Breach TD, new game by Matt Lloyd. Terminus Breach TD is a tabletop multiplayer tower defense game. Players create a map, then choose and upgrade characters, build & upgrade towers, and join forces to defend against 15 waves of evil Drakka.